I’m no fan of gaudy palaces filled with gold leaf and French furniture, nor of the politicians who reside in them, but why do people have lie and fabricate for added effect? The caption of this Facebook post mockingly reads, “In service of the nation” — in juxtaposition to the President and his family enjoying an apparently lavish lifestyle of high fashion and luxurious surroundings. But of course genuine photos alone cannot make this point powerfully enough, so the author of this post had to raid the national galleries of France. 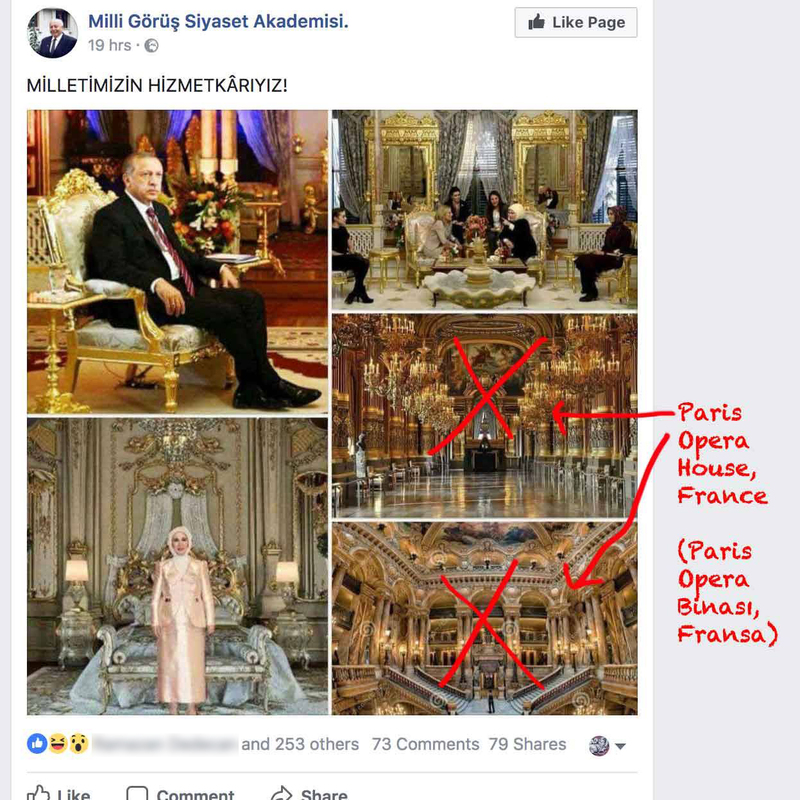 Clearly unable to find a photo of Ak Saray to match the opulence of the Quirinal Palace of Rome or Élysée Palace of Paris, the author decided to use photos of Paris Opera House instead. And with that, his work was done: all who viewed the post were doubly appalled by the extreme vanity and arrogance on display, with its appearance of profound excess in a land where many still live in poverty. That something was amiss ought to have been apparent from the statues and wall paintings evident in the photographs, but discernment is not our strong point. And in any case, all is fair in war and politics: you have to do whatever it takes to bring your enemy to his knees, clearly.